2013 was a year to remember inside the Octagon. With incredible action throughout the year, the UFC was in its prime in 2013, trail-blazing through the sporting World. In this article we review all there was in the UFC, with an overview of the year followed by Submission of the Year, Fight of the Year, Knockout of the Year, Fighter of the Year, Disappointments and more. Vitor Belfort made headlines in the first UFC event of the year, with a head-kick to Michael Bisping - one of three head kick knockouts scored by The Phenom in the year. Vitor Belfort delivered three emphatic performances, putting away Luke Rockhold with a spinning heel-kick, and defeating Dan Henderson with a head-kick in their rematch in November. All three of those knockouts were awarded Knockout of the Night awards. A successful year for the Phenom has him ready to challenge Chris Weidman for the Middleweight strap in 2014. One week later, the UFC Flyweight Championship would be contested four as John Dodson and Demtrius Johnson went the distance in a quick and explosive bout. Demetrius Johnson retained the belt via Unanimous Decision, before going on to submit John Moraga with an Armbar in July, and knock out Joseph Benavidez months later. SuperBowl weekend would be a big one for the UFC too, as the first pay-per-view of the year impressed many-a-fight-fan with Jose Aldo defeating Frankie Edgar in a top-quality battle for the Featherweight title. Earlier on in the night, Antonio Bigfoot Silva stunned Alistair Overeem with a ferocious knockout - one of two demoralizing knockouts that Overreem received in the year. For the next event, the promotion headed across the pond to London, England for a card where the Interim Bantamweight Championship would be on the line. Renan Barao submitted Michael McDonald in Round 4 to keep the belt. On February 23, the Octagon witnessed a monumental moment as Ronda Rousey and Liz Carmouche became the first ever women to do battle in the UFC. Ronda Rousey would be the victor after utilizing her signature armbar with seconds to spare late in Round 1 to put away a very game opponent. It was a huge stepping stone for Women's MMA. The Land of the Rising Sun would witness one of the best fights of the year as Wanderlei Silva engaged in a war with Brian Stann. Wanderlei Silva would become the victor after knocking out Stann in Round 2. Georges St-Pierre would settle his rivalry with Nick Diaz at UFC 158. In a card where Welterweights took to the spotlight, St-Pierre put a beating that would last five rounds onto Nick Diaz, while Johnny Hendricks edged Carlos Condit in the Fight of the Night. Gilbert Melendez fell short of capturing the Lightweight Championship in a close fight with Benson Henderson. This was followed by UFC 159, which saw Jon Jones knock out Chael Sonnen in Round 1 of the main event. Cain Velasquez made quick work of Bigfoot Silva at UFC 160. In a card with heavyweights on the bill, it would set up for a highly-anticipated UFC card in October. Not surprisingly, Junior Dos Santos and Cain Velasquez were the victors setting up for a third fight at UFC 166. With both the main event and co-main event originally replaced due to injury, Rashad Evans and Dan Henderson would be the main event of UFC 161, the weakest card pay-per-view of the year. Rashad Evans defeated Dan Henderson via Split Decision. Anderson Silva returned to the Octagon in the Biggest Card of the Summer at UFC 162. His opponent, Chris Weidman would shock the World by a knock-out of "The Spider" in the second round. Former Middleweight Champion Anderson Silva came under much criticism for not adopting a serious attitude for the fight, but taunting and "clowning" his way to his first ever loss inside the Octagon. It was frustrating for many others too, as Silva's record-breaking win-streak and title reign came to an abrupt end. Jose Aldo's second title defense of the year saw him defeat the Korean Zombie, Chan Sung Jang at UFC 163. Initially set for a showdown between Anthony Pettis and the Champion, Pettis pulled out due to a knee injury and was replaced. A late TKO by Aldo would see him go into 2014 as Champion. One of the most stacked cards of the year would mark the launch of the new broadcast network, FOX Sports 1 in the US. UFC Fight Night 26 saw Chael Sonnen submit Shogun Rua. August closed and September reigned in with one week consisting of three events. Carlos Condit was victorious against Martin Kampmann with a Round 4 knock-out following a ferocious fight. Then, in a night to remember in Milwaukee, a new Lightweight Champion was crowned, as Anthony Pettis submitted Benson Henderson in Round 1, in a Submission of the Year contender. Seven fights were finished out of the twelve on the card. Then, in Brazil, Glover Teixeira celebrated with his compatriots after knocking out Ryan Bader in under three minutes. UFC 165 impressed many around the World with two title fights on the card. Renan Barao defeated Eddie Wineland with a spinning back-kick to retain the Interim Bantamweight strap, while Jon Jones edged-out Alexander Gustafsson in a fight of the year contender. Dana White called it the best card ever, and that can be agreed upon. UFC 166 in Houston saw Cain Velasquez finish Junior Dos Santos in Round 5 to complete the trilogy between two of the World's best Heavyweights. Diego Sanchez and Gilbert Melendez engaged in an incredible fight that was also a fight of the year contender. 20 Years of the UFC were celebrated on 16 November 2013, at UFC 167 when Georges St-Pierre retained the UFC Welterweight Championship against Johnny Hendricks. GSP almost lost the belt with a close fight which could have went either way. Following the fight, Georges St-Pierre announced a hiatus from the UFC - but his fight with Hendricks could have been his very last. Another fight of the year candidate would take place in Melbourne, Australia. 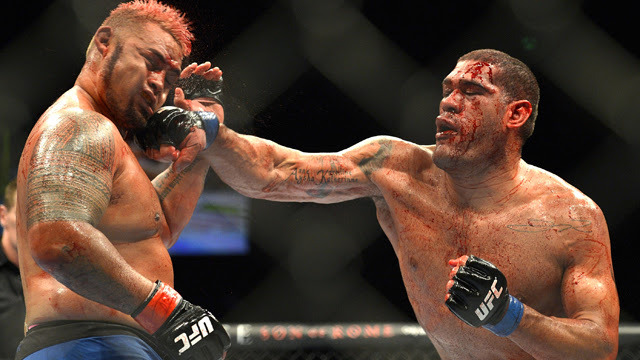 Mark Hunt and Bigfoot Silva threw it all at each other for five straight rounds in one of the best Heavyweight bouts to ever be seen. However, TRT controversy discovered following the fight compromised Bigfoot Silva's performance. "Mighty Mouse" Demetrius Johnson made his third successful title defense in the penultimate card of the year. In a rematch with Joseph Benavidez following their close encounter last year, Johnson left no doubt this time round with a Round 1 knockout. The biggest event of the year would take place in Las Vegas, in an unbelievable night of fights. Entertaining from the outset with the prelims, the main card featured all five fights with finishes. Ronda Rousey went to Round Three with Miesha Tate in the Fight of the Night for the Women's title, while a gruesome injury from Anderson Silva kept the belt in Chris Weidman's hands. Submissions are not as frequent as knockouts in the Octagon, but when they happen, they can come on the biggest of stages, with three title fights ending in big submissions. Other notable mentions were Urijah Faber vs. Ivan Menjivar at UFC 157 and Werdum vs. Nogueira earlier in the year. #3: Ronda Rousey vs. Liz Carmouche: In the inaugural Women's UFC fight, Ronda Rousey submitted Liz Carmouche with just seconds to spare in the first round. Rousey demonstrated great technique to get the submission in a ground-breaking fight. #2: Renan Barao vs. Michael McDonald: In London, Renan Barao's emphatic arm-triangle choke would retain the title. An entertaining battle between the two was ended in a great way. #1: Benson Henderson vs. Anthony Pettis: It was a homecoming triumph for Anthony Pettis as he captured the Lightweight Championship. A superb armbar that resulted in a verbal tap from Henderson. A moment of silence followed by a huge ovation as Pettis was crowned the Champion. Ah, knockouts. There were plenty this year, in the big fights and the smaller ones down the card. They made a statement with three knockouts being ranked in the Top 20 of all time. Notable mentions included Renan Barao's spinning back-kick to Eddie Wineland and Vitor Belfort's knockouts to Bisping and Rockhold. #3: Travis Browne vs. Alistair Overreem: In one of three knockouts from Travis Browne, and one of two knockouts received by Alistair Overreem, a vicious flurry of knees by Overreem was countered with a superb kick to the face followed by punches to finish it. #2: Antonio Silva vs. Alistair Overreem: In the co-main event of UFC 156, Antonio Silva unleashed a vicious combination of punches to Alistair Overreem against the cage. Herb Dean was able to stop the fight but not at ease, having to pull Silva away as he was fired up following the knockout. It was the start of a disappointing year for Overeem. #1: Anderson Silva vs. Chris Weidman: In their first meeting at UFC 162, Chris Weidman shocked the World with this knockout. Anderson Silva was not respecting Weidman's striking, and he paid for it. What a year of fights! Thrilling title fights, Mexican Wars, relentless pursuits for victory. The Octagon witnessed some of the best fights in history this year. Although it doesn't make the list, props to Wanderlei Silva vs. Brian Stann in Japan, that was awesome. #3: Mark Hunt vs. Antonio Silva: In Melbourne, Mark Hunt and Antonio Silva engaged in one of the best Heavyweight fights ever seen. Ending as a draw, both men displayed heart as they battled fiercely. #2: Gilbert Melendez vs. Diego Sanchez: Two Mexican Warriors threw it all at each other for three straight rounds at UFC 166. Gilbert Melendez was victorious via decision, although getting dropped in the third round. They would bite down on their mouthguards and just swing at each other for the finish. An incredible, incredible fight. #1: Jon Jones vs. Alexander Gustafsson: A close, five-round thriller between Jon Jones and Alexander Gustafsson was the Fight of the Year. Gustafsson came within touching distance of the belt, it was a phenomenal contest. With such a year, its hard not to forget some of the best fighters. Chris Weidman deserves a nod for his knockout of Silva, and what we saw in the rematch was promising, but the unfortunate ending comes as a disadvantage to him as many will still doubt his legitimacy as Champion. Travis Browne also had an incredible year, with three knockouts in the best year of his career. #3: Glover Teixeira: In the second card of the year, Teixeira outclassed Rampage Jackson in a dominant decision victory. Then, he would submit James Te Huna before knocking out Ryan Bader. Teixeira has consistently performed in 2013. #2: Vitor Belfort: Well, well. Vitor Belfort has been on fire this year and is on a crash course with Middleweight Champion Chris Weidman in 2014. With three kick knockouts, over Bisping, Rockhold and Henderson, Belfort's year has put him back on track. #1: Demetrius Johnson: UFC Flyweight Champion Demetrius Johnson has rose through the competition to defend his Championship three times over solid opponents. A big win over Dodson in a great fight, followed by finishing Moraga and Benavidez puts him on top as Fighter of the Year. There was a lot of hype surrounding Alistair Overreem after he defeated Brock Lesnar in 2011. It was expected that he would beat Bigfoot Silva at ease, but this was not the case. Overreem looked better against Browne but suffered the same outcome of a knockout. Overreem's performances showed he had the ability to win, but it didn't pay off this year. Maybe he will rise up next year, starting with Frank Mir as his opponent - who also had a disappointing year with a loss to Barnett and Cormier. Other disappointments included Uriah Hall, but following his victory over Chris Leben, he could be back on the way up. 2013 was one of the greatest years in UFC. It had the upsets, the shockers, the amazing fights and everything in between. Even when injuries were the obstacles, the organization got past it well, like at UFC 164 with Pettis replacing TJ Grant. All-round, just an entertaining and groundbreaking year, possibly with next year being a new era in the UFC. A card that was full of great fights including a terrific preliminary card. Dana White said it was one of the best cards in history. Chris Weidman was the first ever man to beat Anderson Silva in the UFC, it was a knockout that sent shockwaves through the fighting World. His injury at UFC 168 was unfortunate, and we may never see Anderson Silva fight again. 2013 could have been the last time that we saw Georges St-Pierre and Anderson Silva inside the Octagon. Two of the best fighters in the UFC may never step inside the Octagon again. If that's the case, a new era is ready to begin, with Chris Weidman the Middleweight Champion while Robbie Lawler and Johnny Hendricks are set to contend for the vacated Welterweight Championship. But which was best? Sound off in the comments below, to determine what was the greatest rematch this year, and what rematches do we need next year? An excellent year of UFC. Thrilling action inside the Octagon, and it was great to look back at it all. Bouncing back from a year that wasn't so good, the UFC have trail-blazed and really grown this year. That's all for a terrific year inside the Octagon. We had it all, and a lot will be remembered while plenty will effect what is looking to be a very prosperous 2014 in the UFC. Full review of the year of 2013 in the UFC. One of the best years in MMA featured some great fights, and it is all reviewed here.